Private 5418 Percy Arnold Kemp, 2nd Battalion, Honourable Artillery Company. Percy was born in Great Missenden, Bucks, in 1896 the son of George Kemp and his wife Charlotte née Marshall. He was the youngest of their ten children the others being James Leonard (born 1883), Ellen Elizabeth (1885), Charlotte Minnie (1886), Ernest George (1887), Cecil Pigram (1887), Harold Curtis (1889), Bertram Marshall (1890), Edward Lionel (1892) and William Edwin (1892). As the dates of birth show, there were two pairs of twins – Edward and William in 1892 and Ernest and Cecil in 1887. Sadly Cecil did not live for long after his birth; in an age when infant mortality rates were high the family could be considered lucky that nine out of ten children survived to adulthood. George was a gardener by trade and his work took the family around the country, as can be seen in the birthplaces of the children: Downe in Kent, Effingham in Surrey, Broomfield in Essex and Great Missenden; by the time of the 1901 census the family (less the two eldest children) were living in the Lodge at Stanbridge Hall, Romsey, Hants. Ten years later a much reduced family was living in Woolhampton with only Percy and the twins, Edward and William, still living with their parents. Edward and Percy were following their father’s example and working as gardeners, but William was employed in a relatively new field as an electrician (the census enumerator qualifying this as ‘driver and assistant’). to the Kemp family from 1913. 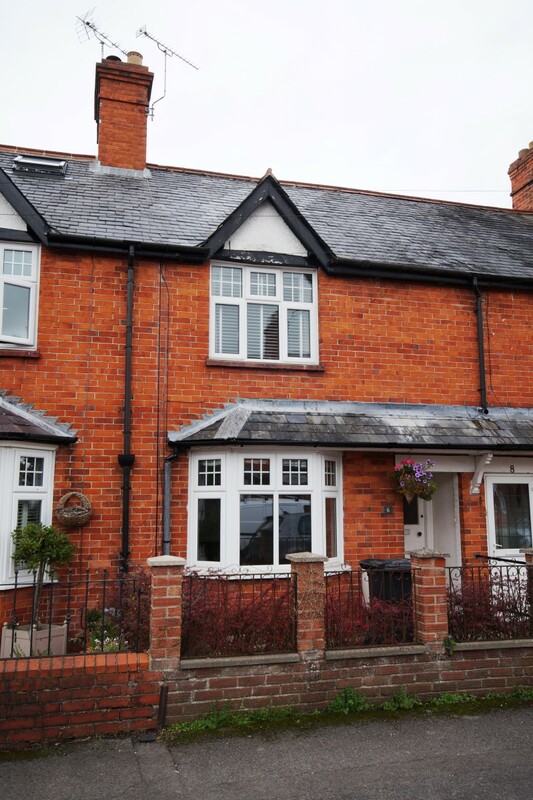 In 1913 George moved the family in to Newbury where they lived in a house called Glen Rosa in Kingsbridge Road (now No 6). When war broke out in 1914 Percy was eighteen – still too young to serve in a combat role, which may have dissuaded him from enlisting in the initial rush (though many younger boys lied about their age in order to do so). However, by late 1915 the pressure for more volunteers mounted. A new scheme was introduced by the Minister for Recruitment, Lord Derby, that encouraged men to come forward and ‘attest’ (sign up) for service at a later date. Men attesting under this scheme would be called up as and when needed and training places were available; the actual date of call up or mobilisation, would be dependent of the man’s ‘group’ which was determined by age and marital status. The scheme, known as the Derby or Group Scheme, was the last point at which men could enlist into the unit of their choice. In January 1916 conscription was introduced and men were allocated to army roles according to their skills and the army’s needs. The scheme resulted in a large surge of recruits – many of whom opted to be mobilised immediately rather than wait for the call. Percy signed up on 22 November 1915 into the Honourable Artillery Company (HAC) at their regimental HQ – Armoury House in Finsbury. This was a Territorial army unit with a very long history – the oldest regiment in the British Army. As the name suggests this was an artillery unit and it sent five batteries to fight in the Middle East and on the western front, but it also supplied two battalions of infantry, one of which was among the first Territorial battalions to arrive in France in September 1914. Imperial & General Service Obligation signed by Percy. The irregular shape and general state is evidence of the fire that destroyed so many service records in 1940. One of the features of service in the Territorial Force was that pre-war service conditions meant that members were only committed to serve in a home defence role - they could not be sent overseas to fight. Immediately war was declared this was recognised as a problem and all Territorials were asked to volunteer for ‘Imperial Service’ wherever needed. Around 70% of the men volunteered and signed a form known as the Imperial Service Obligation. One of these forms has survived in Percy’s service record held at the National Archives in Kew. However, Percy was not offered the choice of not signing – Territorials recruited after the war had begun would sign the Obligation as part of their enlistment; there was no way the Army was about to allow men to avoid overseas service by signing on for home duties only. Those who signed the Obligation in 1914 formed the core of the 1st Battalion (strictly speaking the 1st/1st Battalion) and those who didn’t sign became the nucleus of the 2nd or 2nd/1st Battalion. 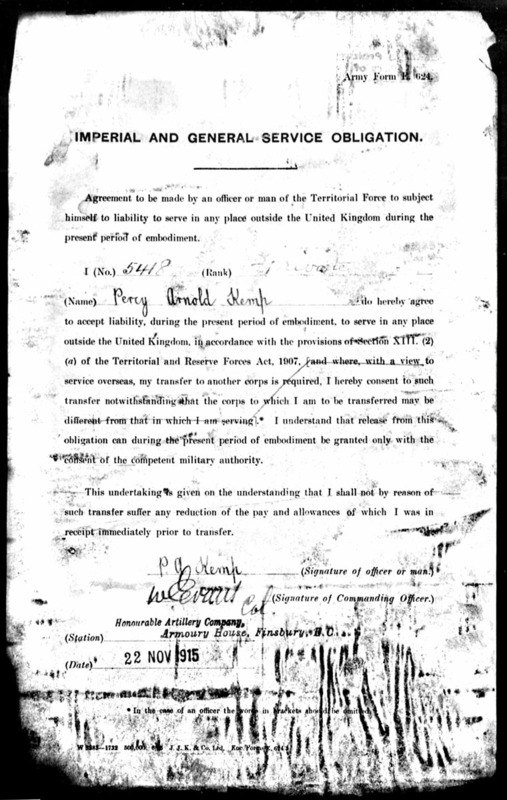 The Military Service Act of 1916 effectively changed the terms of service of all Territiorials when the Army offered those who hadn't signed the Obligation the choice of signing or being dismissed and immediately conscripted. In order to remain with their mates almost all signed on the dotted line. This meant that the 2nd Battalion could be sent overseas and, on 3 October 1916 it landed at Le Havre and was placed under the command of 22nd Brigade in 7th Division. Percy began his service with the 3rd/1st Battalion (the regiment’s Territorial infantry training and reserve battalion) and trained at Wimbledon and Orpington. Life with a large group of men living in close quarters meant that bugs were easily spread; Percy spent 11 days in hospital with rubella (German measles) and 20 days with scarlet fever taking a month out of his training and, presumably, delaying his deployment to an active unit. Having completed his training he was posted to the Tower of London to await his turn to go to war. On 10 December 1916 he was posted to the 1st Battalion. The following day he arrived at No 7 Infantry Base Depot (IBD) at Le Havre. IBDs were holding camps which would hold men until transport was available, supplementing their training as deemed necessary. Each IBD would service the battalions of a number of regiments; as the war progressed regimental affiliations became increasingly less important – a man would be sent to a battalion in need whether it was in the man’s current regiment or not. Percy was not diverted to a different regiment, but was sent to the HAC’s 2nd Battalion rather than the 1st Battalion he had been posted to from England. 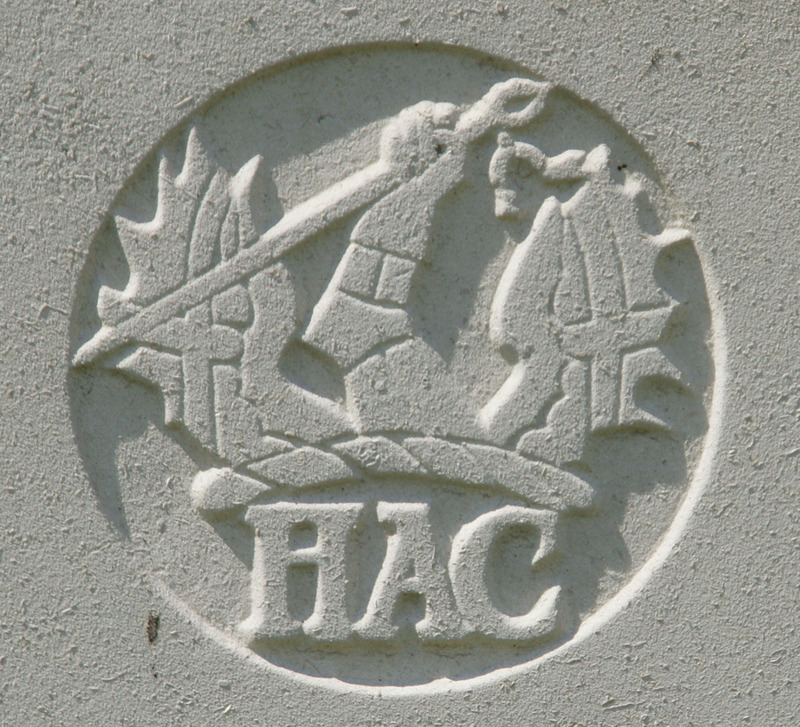 as used on CWGC headstones. Percy joined up with the 2nd Battalion (22nd Brigade, 7th Division) in the field on 5 January 1917 and was posted to B Company. In April he had a few days at 23 Field Ambulance (not a vehicle - a medical facility near the front line) with ‘I C T Foot R’ – inflamed connective tissue in his right foot. Foot problems were commonplace in the cold wet trenches. On 3 May he was wounded in action near Bullecourt, receiving a minor wound to his right thigh. He was admitted to the Field Ambulance on 5 May but returned to duty on 11 May; so it can have been little more than a grazing blow. Nevertheless, without recourse to antibiotics any wound was potentially lethal. The battalion remained in the Bullecourt area until August 1917 when orders were received by the 7th Division to move north and to join X Corps in 2nd Army. General Plumer, commanding 2nd Army, had just replaced General Gough of 5th Army as commander of the great British offensive in Flanders. Using his favoured ‘bite and hold’ tactic of assaults with limited objectives – aimed to capture German positions without going so far as to leave the protection of the shorter range artillery. Having captured positions the men would dig in and prepare to face the inevitable German counter-attack (which the field artillery would be able to disrupt). At the Battles of Menin Road, Polygon Wood and Brooseinde the tactics proved a great success – helped greatly by a spell of good weather. The 7th Division arrived in time to take part in the latter two assaults. A fourth assault was planned for 10 October, when the aim was to finally capture the high ground of the Passchendaele Ridge. Sadly the bad weather that dogged British efforts that summer had returned and the ground over which troops had to travel up to the line and beyond to the ridge became a quagmire. With hindsight, and even then, it seemed sensible to delay the attack, preferably until the rain stopped for a few days; however, Haig pushed for action and influenced Plumer to uncharacteristic optimism. Haig was poorly advised by his intelligence chief (General Charteris) who was forever advising him that the enemy was on the point of collapse, and Haig recalled his own experience in 1914 when it seemed that one more German attack would have spelt the end of the BEF – it did not come and the front was stabilised. So he never wanted to give the German’s the breathing space they gave him at the end of the 1st Battle of Ypres. As a result the date of the assault on the Passchendaele Ridge was not delayed – it was brought forward a day! 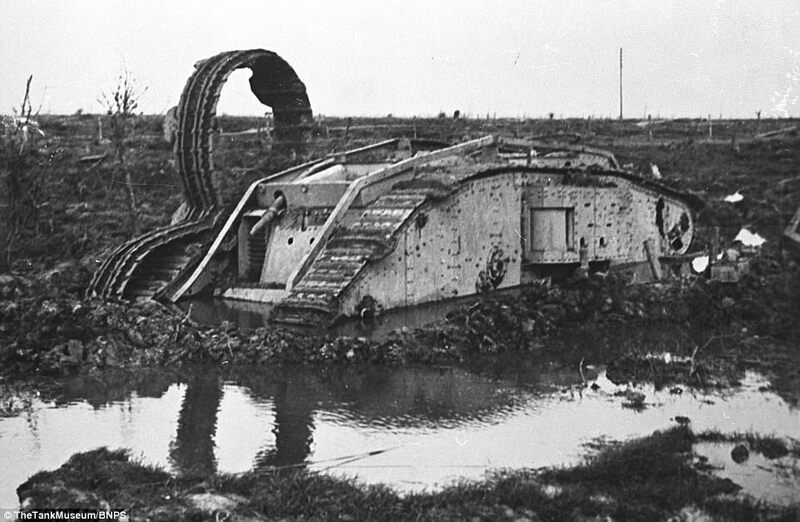 Ten tanks were available to support the assault, but ground conditions meant that they bogged down as soon as they left the roads – consequently they all advanced up the same road and were all disabled or stranded in the mud before they went into action. The infantry were exhausted by the time they reached their start points along a 7½ mile front, despite this some gains were made, but mainly towards the north of the village of Poelcapelle at the northern end of the line. As a result of these strategically insignificant gains the battle gained the name of the Battle of Poelcapelle disguising the total failure to take the far more important Passchendaele Ridge to the south. On the left the 7th Division, which had extended its front southwards to Black Watch Corner (south-west corner of Polygon Wood) in order to relieve the 21st Division, occupied the final objective given to that division for 4 October, including Reutel village and the commanding observation area thereabouts. This successful advance was made by the 2/1 HAC and 2/R Warwickshire of the 22nd Brigade. In reality there were still fighting the Battle of Broodseinde! However, they did achieve their objectives – at a heavy cost (56 killed, 198 wounded, 42 missing). KEMP – Killed in action on October 10th, 1917, in France, Pte Percy Arnold Kemp, Signal Section Honourable Artillery Company, youngest son of G Kemp, Glen Rosa, Kingsbridge-road, Newbury. 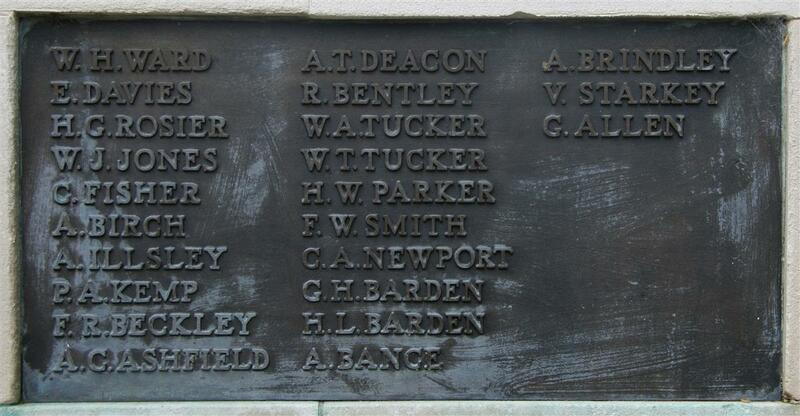 Percy’s name may well have been among among the 42 listed as ‘missing’ after the battle. His remains were never identified and, as a result, his name is remembered on the Tyne Cot Memorial to the missing not far from where he fell. Locally Percy is remembered on tablet 6 of the Newbury Town War Memorial and also on the roll of honour and memorial board in St Nicolas’ Church, Newbury.